Wide waterproof sealing tape for wall floor joints and corners. Delta Corner Strip is a flexible adhesive strip used to seal corners and wall to floor joints in basement waterproofing systems. It can also be used to overseal joints on cavity drain membranes and for patch repairs. 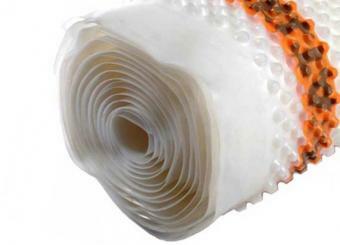 It is a wide waterproofing tape at 150mm that creates a water-tight vapour seal.